Primes nails for ultimate adhesion. Cures in 1 minute under UV light or 30 seconds under LED light. Gives nails a mirror-glass finish. Cures in 2 minute under UV light or 30 seconds under LED light. Mattify Top Coat creates contour, multiple tones and art designs. Apply Mattify Top Coat where you desire a matte, velvety finish, giving a variety of textures to your nail designs. A gel adhesive that promotes maximum adhesion for clients with problematic nails. Powerbond can be used on all types of ibd gels; traditional UV gels, traditional soak off gels, and gel polish. Apply and let air dry prior to gel application. Apply over your favorite Gel Polish color. Recommended with light to medium gel polish shades. 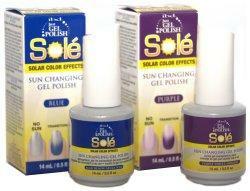 Sole is applied between Gel Polish color and Top Coat. Combines cleansing & sanitizing into one step! Use for the ultimate gel shine. Contains fast acting anti-fungal and anti-bacterial agents. The first and last step in gel application. Removes oil and cleans the nail prior to gel application. Removes excess gel after curing.